The city of Puri on the banks of Bay of Bengal is not only famous for its beach but is also an important religious town. Hundreds of thousands of pilgrims throng to this place to pay a visit to the renowned temple of Lord Jagannath. During Rath Yatra of Lord Jagannath sister Subhadra and Brother Balbhadra vast canopies are required. 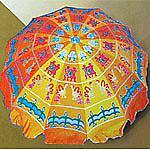 The canopies are a representation of the beautiful craft of Applique and Patch work of Orissa. It's an important traditional craft and followed in Bhubaneshwar and its adjoining areas. The process involves making a large piece of cloth by joining figurative animals, flowers, geometrical shapes and motifs. This large cloth can then be converted into useful products. Apart from temples activities, the canopies are used in festivals and pavilions. The Pipli village, which is close to Puri is the centre for some lovely applique and patch work of Orissa. The applique craft is also very popular in Puri. The products included lamp shades, garden and beach umbrellas, kitchen accessories, bed and table linen, handbags and other furnishing items.